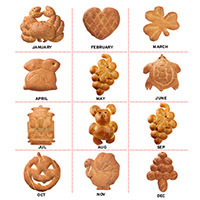 Our most experienced bakers create charming seasonal loaves*. 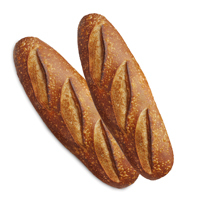 And with such care in making them, they look as good as they taste! 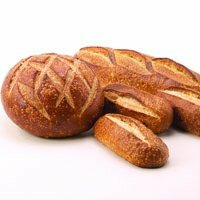 Join our seasonal bread club and you or your recipient will receive two 1 lb loaves a month. $21.95 plus S&H is per month! 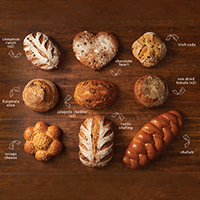 The best of both worlds all year with a Sourdough round plus specialty bread like Cinnamon Raisin, Chocolate Heart, Irish Soda, Jalapeno, Sun Dried Tomato, Sweet Cinnamon, Garlic Asiago, Olive, Rustic Stuffing & Challah. 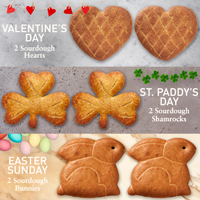 Join our Spring Seasonal Bread Club and receive sourdough hearts, shamrocks and bunnies, just in time for each occasion!